There are so many beautiful Christmas stamps in the 2009'-10 Stampin' Up! catalog that it can be hard to choose. One year I made my Christmas cards all the same and I got a little tired of doing the same design over and over. So the next year, I made many different designs with several different stamp sets. That ended up being a little much - at least for the time I had available. The big question in selecing Christmas stamps is how many sets and what sets do you want? For me the question - no matter the season - is how much use am I going to get out of this set? This year I ordered Season of Grace to do my Mother's Christmas cards. This set has three image stamps and two message stamps. At first I thought it might be limiting but I've realized from the SU catalogs, Splitcoaststampers gallery and my own experiementing that there are many different cards I can do with that set. I plan to use it next year for my cards and I've already used it for a Stamp-a-stack. Serene Snowflakes shown in the last two posts of course makes really pretty holiday cards. And it doubles as just a beautiful intricate design for background or featured images on many cards and scrapbook pages. I'm sure I'll have this one out all year. Season of Friendship is designed for the 4 seasons. 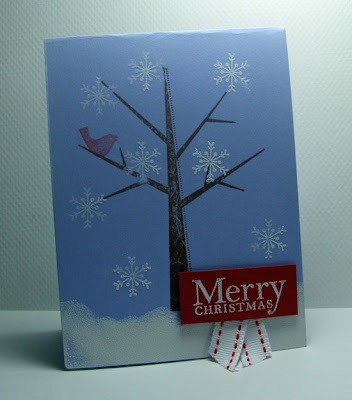 What better way to celebrate the holidays (if you live in a cold December climate) than the card above with white snowflakes and sponged and embossed white ink for snow. Cardinal's are the NC state bird and a frequent visitor to our winter bird feeder. Finally, I pulled out 'old faithful' that little truck set called Loads of Love. Here is the card we made. So I have many options for Christmas this year and I bet you do too. When picking a stamp set, consider the cards you can make for yourself or to give to friends or family to give. A beautiful set of handmade Christmas cards makes a wonderful early Christmas present. Go through the sets you already have. Anything wintery you could use for the holidays? 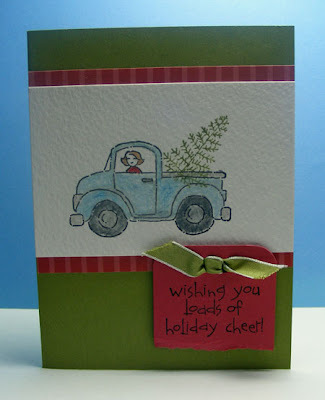 Or what about using the new ornament punch from the mini catalog with designer paper and some ribbon for a non-stamped card. Also, you might consider doing a swap at some point with other stamperss so everyone gets a fresh holiday set to use. Your cards are both wonderful, Lisa. I love the snowy ground that you did on the first card.. such a dreamy beautiful feel.